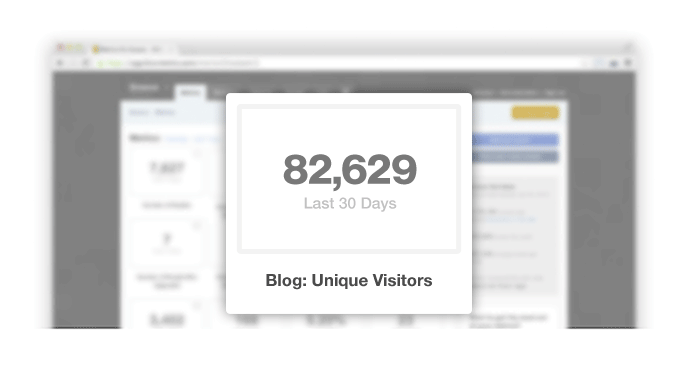 We recently hit a big milestone with our email list. Here’s how we did it. A lot of people are not going to like this post. A lot of people are going to read the headline on Twitter, click on the link, and be very, very disappointed by what they find. 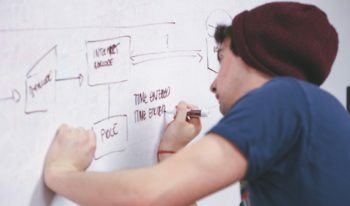 Those are the people that, most likely, will never build a list that drives their business forward in a meaningful way. We hit a big milestone a couple of weeks ago: 100,000 email subscribers. Like every other milestone, I wanted to share exactly how we did it, so that readers of this blog can learn from our journey, figure out a way to apply our lessons to their own business, and find success. But the more we mapped specific wins along the journey from zero to 100,000 subscribers, the more we realized: a lot of people are going to find the answers deeply unsatisfying. I wish that there was a brilliant tactic or quick fix that we could point to and say: that’s where everything changed. But in reality, what got us here—and, based on what I know from talking to people with much, much larger lists, what got them there—is a few big, important things, done consistently over time. There’s something that we noticed very early on when it came to collecting emails: traffic was the only thing that consistently solved our “too few subscribers” problem. 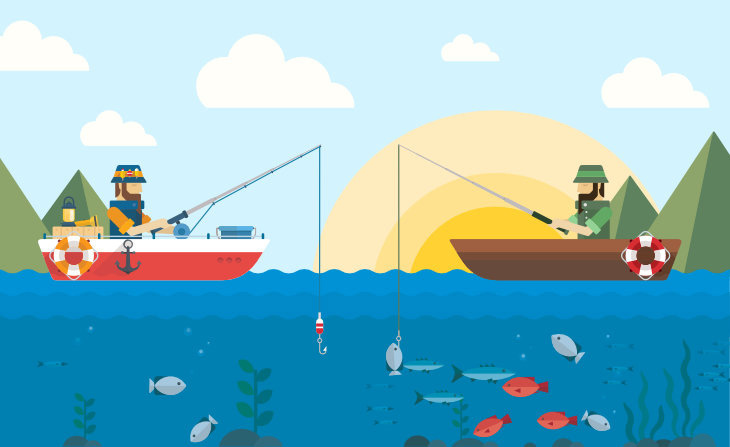 If you’re struggling to catch fish, you could go and try different kinds of bait, get a new rod, or read up on the thousands of tactics that could help you pick off a few more fish. Or, you could go find a fishing spot that has ten times as many fish in it. Which one do you think would put more fish on your table? Increasing your visitor-to-subscriber conversions are no different. You could run A/B tests until you turn blue in the face, but one of the most important realizations that we had was this: sending more and more traffic to the site increased email subscribers, 100% of the time. On a small team where we can’t focus on many different strategies at once, we decided that in order to increase our email list—and achieve a host of other marketing goals we had—we’d focus on traffic. Yes, there were some tactics that helped a little, and I’ll share those, too. But if there’s one thing to take away from this post, it’s that just like in most other aspects of business, if you want to win, focus on big, long-term wins rather than quick fixes. Here’s what helped the most. Perhaps the most important answer is the UIU principle. I wish that I had a source for this, because I didn’t come up with it; I picked it up along the way from someone much smarter and more experienced than I am. If it was you, please do let me know and I’ll update this. The UIU principle boils down to this: *no matter what you’re writing about, your benchmark for every single post should be to make it **Unique*, *Interesting* and *Useful*. 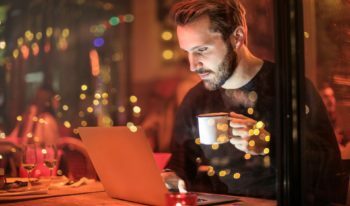 No matter what you’re writing about, your benchmark for every single post should be to make it Unique, Interesting and Useful. 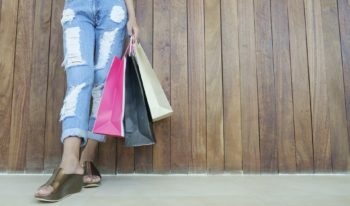 Unique: Does this post stand out from everything else that has been written on this topic? It doesn’t matter if something has been covered a thousand times; find an angle of approach that makes yours the best. Interesting: Does this post entice the reader to keep going at every point? Are you using stories, images, research, or other devices to make the post not just readable, but irresistible? Useful: Can the reader do something with the content? Do you make it clear what that something is? Applying these benchmarks to every piece of content will give every post you publish immense staying power compared to others in your space, and that’s what will keep the traffic—and email subscribers—coming. Takeaway: Before you publish, test every post against the UIU principle. Does it pass? Challenge yourself to dig deep and make every piece of content unique, interesting and useful for your readers. To be memorable, you must be unique. Not just each post (like we talked about above), but the entire positioning of your blog. That doesn’t mean that you have to solve different problems from everyone else. It just means that you have to address those problems with a unique angle. We got no traffic—literally dozens of visits a month—when we first started writing content that essentially copied the approach of the best in the industry. It was only once we rebuilt the entire operation from the ground up, with a completely unique angle, that things began to change for us. 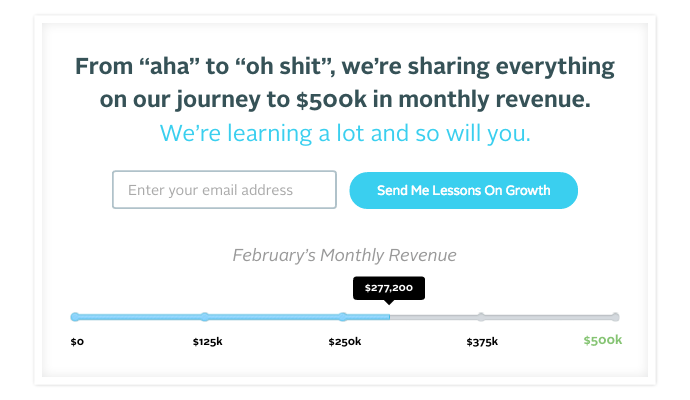 For us, that meant sharing our journey from zero to $100,000 (and now $500,000) in monthly revenue, and being transparent about our wins, fails and lessons learned along the way. For you, that might mean a particular content style, format or voice that isn’t being used yet. Most importantly, it means that you shouldn’t try and copy other publishers completely. 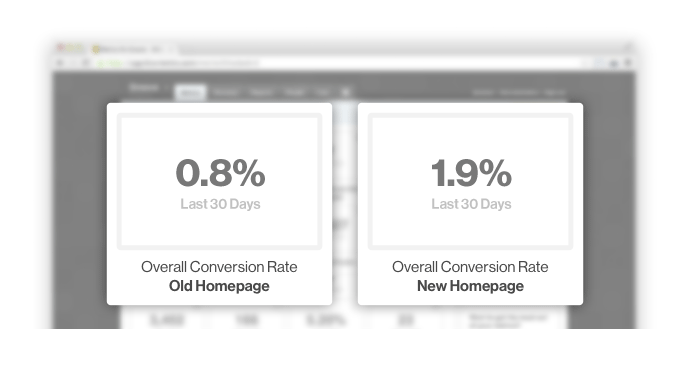 You’ll never be a better HubSpot than HubSpot is, and we’ll never be a better Unbounce than Unbounce is. We try and be the best Groove that we can be, and you should embrace your own voice and be the best “you” you can be. Takeaway: Don’t try to be someone you’re not. Be inspired by successful businesses and people in your field, but use your own voice and personality unapologetically. That’s how you find your true fans; the people who will love you, and buy from you. 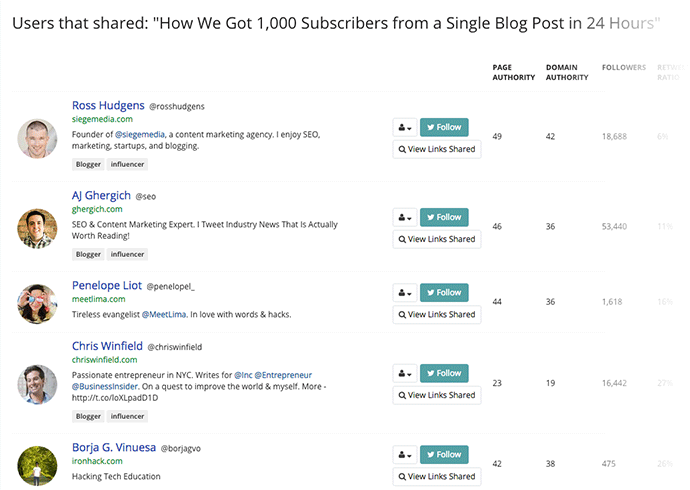 Our post on influencer outreach remains one of the most highly-trafficked pages of this blog. There’s a very good reason for that: it’s probably the biggest marketing win we had in launching our blog, and is solely responsible for millions of site visits and thousands of email subscribers. And other businesses are finding success by doing the same thing. When we launched, rather than taking the usual “publish and pray” approach, we spent many hours building relationships with the influencers who would end up being the launchpad for our first serious traffic numbers. We started by identifying the influencers in our space. It was a painstaking process for us, but it’s now much easier using BuzzSumo. Find a few pieces of content that have been successful in your space. 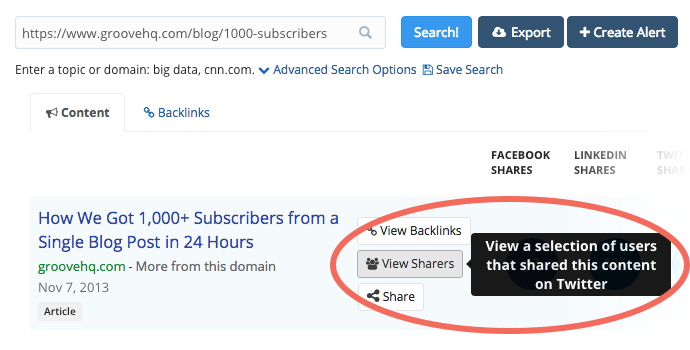 Enter the URL in BuzzSumo’s search field. Which makes for a terrific place to start your influencer outreach. For more on our outreach and promotion process, including word-for-word scripts and an engagement spreadsheet template, see our post on influencer engagement. 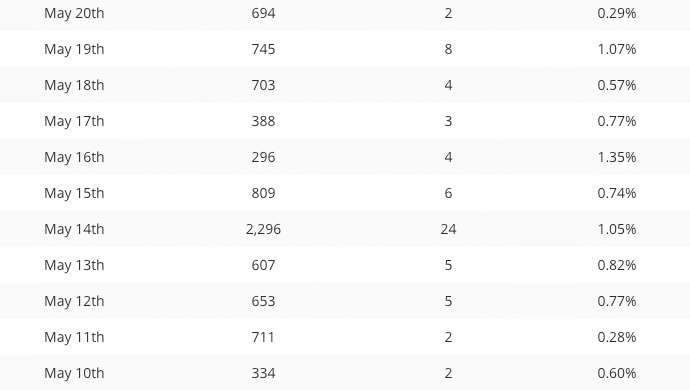 Fueled by our influencer engagement, the blog quickly began driving visitors to our site, to the tune of 80,000 uniques in the month after we launched. Takeaway: The best way to generate massive exposure is by going to massive new audiences. Finding influencers and building mutually beneficial relationships with them has been an invaluable strategy for us, and I recommend it to anyone trying to build their audience. 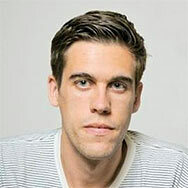 There’s an excerpt in Ryan Holiday’s terrific book, The Obstacle Is The Way, that I return to time and time again. In 1878, Thomas Edison wasn’t the only person experimenting with incandescent lights. But he was the only man willing to test six thousand different filaments⁠—including one made from the beard hair of one of his men⁠—inching closer each time to the one that would finally work. And, of course, he eventually found it – proving that genius often really is just persistence in disguise. Nikola Tesla, who spent a frustrated year in Edison’s lab during the invention of the light bulb, once sneered that if Edison needed to find a needle in a haystack, he would “proceed at once” to simply “examine straw after straw until he found the object of his search.” Well, sometimes that’s exactly the right method. The space between starting and succeeding is a long, challenging and lonely one. But if you stick to doing things that move you forward each day—like the wins above and below—you can know that you’ll make it to the other side. Just don’t let the journey defeat you. It’s a mindset that will help you in all of business (and life), but it crushes so many would-be successful marketers who give up when they don’t see the traction that they want early on. Getting to 100,000 subscribers took us three years. That’s a really, really long time. But however many email subscribers you have today, if you have more than that tomorrow, then you’re on your way to 100,000, 1,000,000 and beyond. Takeaway: Just. Keep. Going. If you take a step, even a small one, every single day, then you’re on the right track. These tactics are not the primary thing to focus on. Make sure that you’re doing the four things above right first. But once you’re confident about that, try these; they’re the little wins and tests that ended up netting the biggest results for us. Our goal was to make it easier for people to sign up, so we started by testing a number of sign-up forms in different places, from pop-ups to buttons embedded within posts. We wanted to find the best mix of effective conversions and unobtrusiveness that doesn’t annoy readers too much. The first win was a scroll-up box that appears when a reader reaches the end of a post. This form has been converting at around 1.4%, and we’ve gotten just under 2,000 signups from it. Takeaway: A great time to ask a reader to subscribe is right after you’ve convinced them of the value of your content, so the end of a post is a natural place to do that. A scroll-up box adds a dynamic, eye-catching call-to-action that isn’t as easy to miss or ignore as simply having an embedded form at the bottom of your post. We also began to experiment with Top-of-Page signup bars, testing SumoMe on this blog and Hello Bar on our customer support blog. Conversions on these vary day by day, but hover at just under 1%. 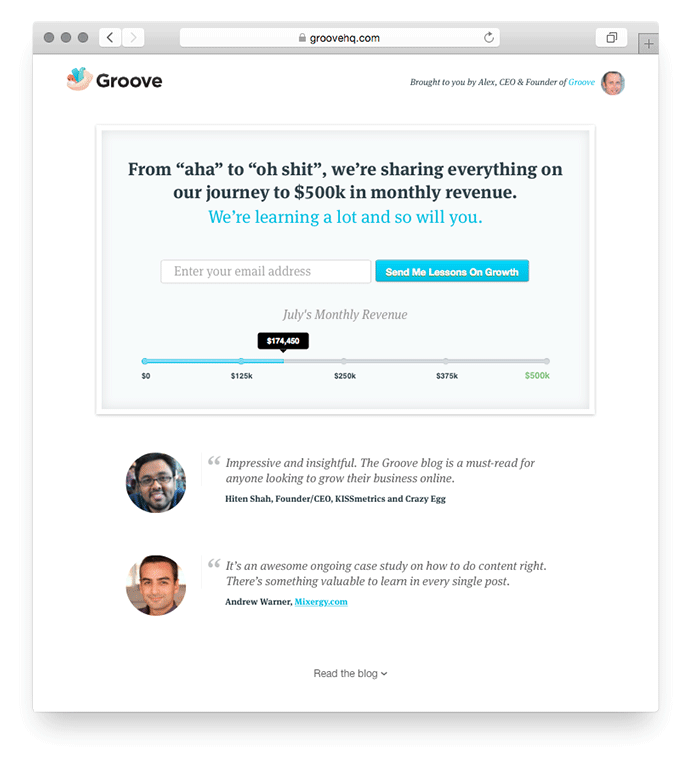 Like the scroll-up box, we’ve seen around 2,000 signups from the bar on this blog. 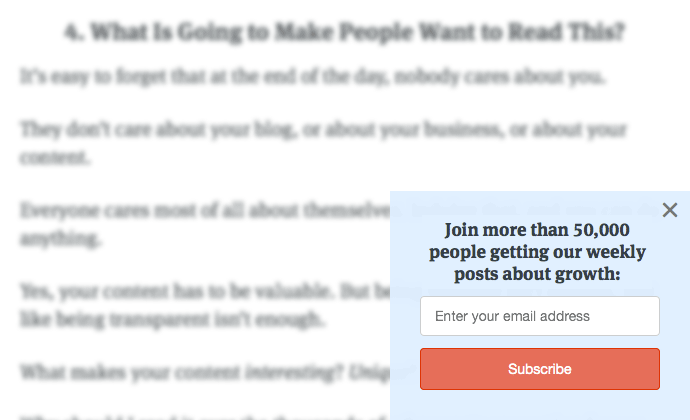 Takeaway: The benefit of Top-of-Page bars is that they follow the reader without being disruptive, so that they’re always right there at the moment that the reader decides to sign up. Borrowing an idea from Noah Kagan, we tested a simple blog homepage that featured a signup form and some testimonials from recognizable faces for validation. To actually read the blog, a visitor must click a link at the bottom of the page. We gathered and tested a half-dozen different testimonials, and interestingly, the page performed best with the same two influencers that Noah has on his page – Hiten Shah and Andrew Warner. As soon as we made the switch to this blog homepage, subscriptions began to increase, and we owe a big debt of gratitude to Noah, Hiten and Andrew for that. Thanks, gentlemen. The new design has generated more than 10,000 signups since we implemented it. Takeaway: Build your site for the result that you want, and don’t worry about what the “standard” is. If your number one goal is to get subscribers, don’t be afraid to make that ask right away, as long as you back it up with good reasons for the visitor to sign up. We spent a lot of time writing an eBook that would be worth downloading, compiling years of lessons from this blog and our business into a single resource. We’ve offered this content in a number of different channels (from landing pages to our SumoMe bar and beyond), but the highest-converting place we’ve offered it is inside of our blog posts. This piece has more than paid for itself already, with around 7,300 downloads, and more importantly, it has validated an important tactic for us that we’re going to be experimenting with a lot moving forward. Takeaway: People don’t give away their email addresses lightly. You have to give them a good reason, and exclusive access to a high-value content is as good a reason as any. There are a lot of things that we need to do better. Many businesses are much, much better at collecting email subscribers than we are. They grow their lists faster, they know more about it, and they’ve been doing it for longer. 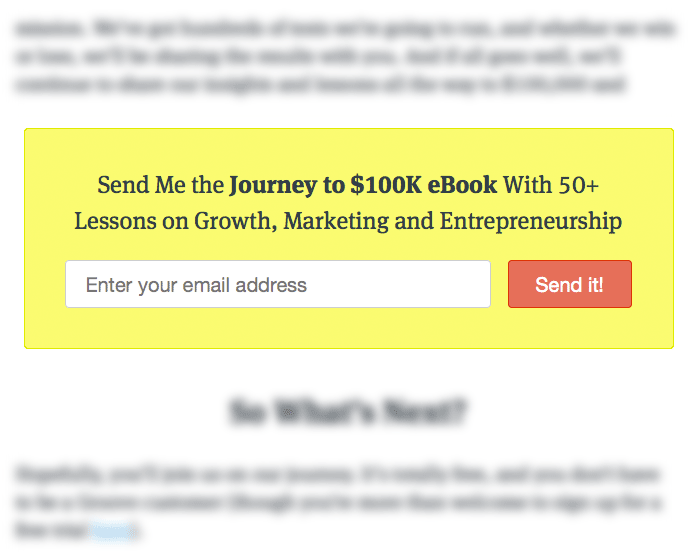 We’re far from great at this, and I think that that’s part of the value of this post: you don’t have to be great at email marketing to grow a list that drives your business. We’re a prime example of that, and if you don’t consider yourself a great email marketer either, I hope that this post encourages you to push forward anyway. There’s a lot that we’re working on improving in our email marketing. Our blog emails need to be better. Our segmentation needs to be more sophisticated. Our visitor-to-subscriber conversion rates need to be higher (something we’re working on heavily this quarter, and will continue to write about). We’ve gotten here by focusing on one thing at a time, and knowing that there are tradeoffs to that. But that’s how progress is made. But there isn’t. It simply doesn’t exist. With that said, there are a lot of tactics that can help you succeed. But to get to where most of us want to go—that is, build a list that sustainably grows your business over time—focusing on big wins is where success lies. I hope that this post has convinced you to take a look at your own email marketing, and that you’ve come away with some wins (big and small) to apply today, and for a long time to come.